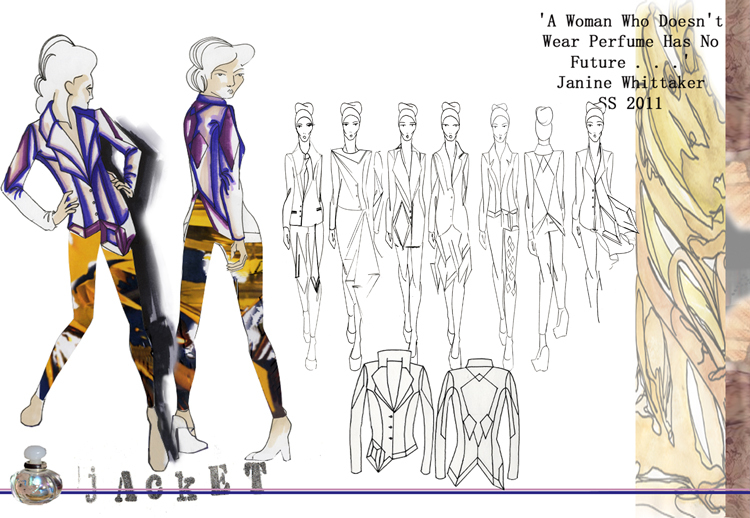 Inspired by patterns, colours and illusions of reflection and glass, 22-years-old designer Janine Whittaker created clever, intoxicating prints and merged them with elegant tailored garments which celebrate the luxury and seductive nature of perfume. 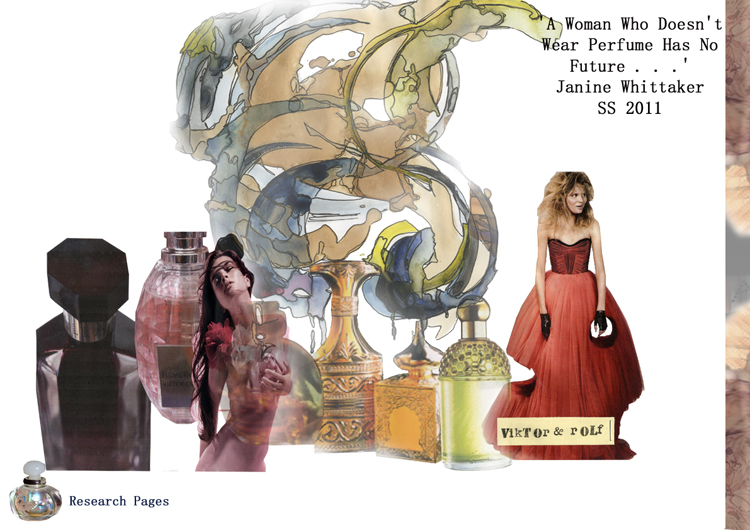 Playing with the concept of the hour-glass figure, femininity and scents, Janine Whittaker‘s collection embodies beautifully fitted garments. Inspiration from patterns, colours and illusions of reflection and glass. 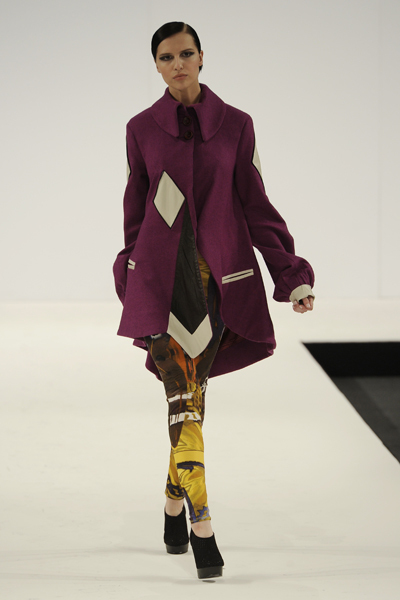 The University of East London graduate’s collection, which she showed at the Graduate Fashion Week 2011, is based on the shapes of perfume bottles, focussing specifically on diamond shapes as detailed motifs. There are elements of surface embellishments; butterflies and cocoons, skeleton and bone structures glimpse from the sleek fabrics, taken from the patterns, illusions and colours of broken glass. I love the prints vs bold uni colour scheme. Play with the hour-glass figure. Janine, how did the name of your collection come about? My collection is called ‘A Woman who doesn’t wear perfume has no future’ quoted by Coco Chanel, based on the luxuriousness and femininity of perfume. My design signature is the juxtaposition of vivid print, mixed fabrics and fitted garments. I mainly used lamb nappa, wool, and different weighted jerseys including a coated jersey. Quality fabrics and directional design are Janine Whittaker's strong point. Love the print's colour scheme and the defined shoulder lines. The wearer should feel luxurious and feminine but at the same time innovative and new in my clothes. If the collection would be a country – what land would that be? My collection would definitely be Paris, France, which I consider as the best at perfuming. 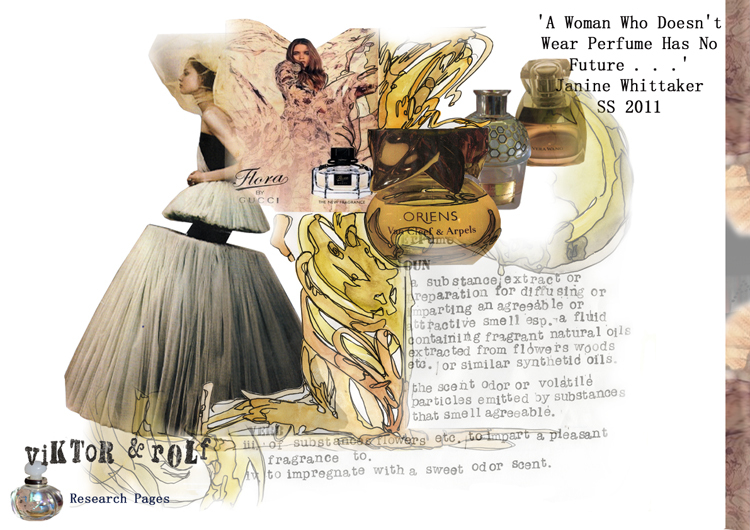 Celebrate the luxury and seductive nature of perfume. Do you have a favourite piece of your collection? My favourite piece is probably the wool skirt, as it takes the elements from my concept but is probably one of the most wearable pieces in my collection. I was listening to many things when making my collection; from Alicia Keys to Drake (R&B and hip-hop) to Ellie Goulding to Warpaint and The Foals (Alternative rock), so quite a lot of different stuff. I tend to have my iPod on shuffle and then I just skip and choose to what I fancy, really. Today I had banana and porridge! I hope to see myself working as part of a design team for an upper high street brand or with a designer, possibly having completed a masters? I don’t know yet, the world is my oyster. Bringing some colour and structure in those rainy days.